One of the frustrations for me while living in Lebanon was the reputation the country has in the West. The word “Lebanon” conjures up dark images of war, sectarian tensions, political crises and humanitarian displacement. These are, of course, salient features of Lebanon’s past and present; it is on this image, and the preoccupation with it in the West, that my livelihood as a journalist depended to a large degree. But the more time I spent as a resident of Lebanon, the more I saw things in the country that are rarely reflected in Western media. I also met with strange disinterest from editors when I pitched ideas that didn’t involve some form of conflict or misery. Lebanon is unique in the region for many reasons. It is small yet crucial to the balance of power between the West, its Mid-East allies, and “non-aligned” countries like Syria and Iran. It also has the most diverse demographics of the region, which are both a curse and a blessing. There are 17 officially recognized sects sharing governmental power in a slow, halting political system of compromise. But while this particular system of confessional politics entrenches sectarian mentalities, it also keeps a fragile kind of peace. In addition, it makes Lebanon a place to which many people from around the region feel they can flee in times of danger and crisis. Here is the paradox: While Lebanon is often a zone of conflict, it is also a perpetual refuge — now for Syrians, but in the past also for a diverse group including Iraqis, Palestinians and Armenians, among others. Lebanon is a refuge for the exact same reason that it is also a weak political entity and prone to conflict: It contains a wide and diverse population that is loosely held together in a national pact. This loose configuration can sometimes lead to conflict, but its looseness also means that there are pockets of liberalism and conservatism that coexist; there are spaces where many kinds of people can be — and feel — safe. So while Lebanon is a place where people may run and emigrate from in times of war, it is also a place where many kinds of people can run to. It can be home to all kinds of people. It can be both a heaven and a hell and, in my experience living there, heavenly and hellish experiences tend to coexist in close proximity. My frustration has been that Western media tends to focus on the hellish aspects only. This is why it was a pleasure to report this story, looking at Lebanon’s most recent incarnation as a refuge — one for Syrian Christians and Muslims. A bishop I interviewed for the story said, with respect to Christians leaving Iraq and Syria, “The Middle East without Christians is not the Middle East.” By the same token, I would say this: The Middle East without a pluralistic, open, welcoming Lebanon is not the Middle East. 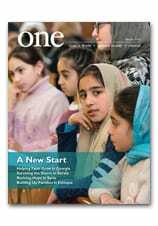 Read more about Syrians Crossing the Border into Lebanon in the Spring 2013 issue of ONE.